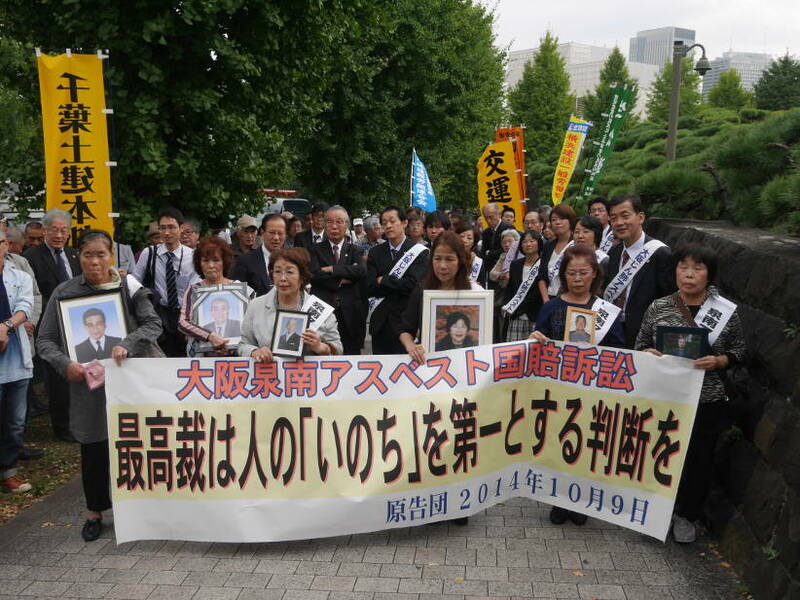 On October 9, 2014, Japans Supreme Court issued the final word in two class actions brought by 89 former asbestos workers which had been languishing in the lower courts for eight years. Asbestos victims, family members, campaigners and supporters awaiting the results outside the courthouse in Tokyos Chiyoda Ward erupted in cheers when the results were known. This was the first time the Supreme Court ruled against the Japanese state in an asbestos case. The factories at which the plaintiffs had worked were located in the Sennan district of southern Osaka Prefecture; asbestos spinning and weaving was done by small companies, most of which have gone out of business and are therefore unable to compensate workers now suffering from asbestos-related disease. More than a dozen claimants have died during the litigation. Voicing the unanimous verdict, Judge Yuu Shiraki condemned the Government for failing by 1958 to have legislated that factories be equipped with mechanical measures to remove asbestos dust from the air; guidelines which had been issued were advisory and not mandatory. The five judges who adjudicated this case found that the Governments failure to take timely and appropriate action was extremely unreasonable as well as illegal. As a consequence of its negligence, the Government was liable for asbestos-related diseases contracted by two groups of claimants including ex-factory workers from Osakas Sennan industrial district.1 The Court ruled that the Government had no liability for negligent exposure after compulsory regulations were issued in 1971. The Supreme Court verdict ordered the Government to pay compensation totaling 330 million (US$3m) to 54 plaintiffs in one of the lawsuits; in the other, the judgment overturned an earlier decision and returned the case to the Osaka High Court for a determination of compensation payments for 28 plaintiffs. 2 Asbestos victims win landmark legal battle as state faulted for poor ventilation. October 9, 2014.